Meeting planners have more than enough to think about when it comes to searching for the perfect venue – and eco-consciousness is increasingly making its way top of mind for many. It is currently estimated that the average hotel guest generates 2.2 pounds of waste each night of their stay. And, with the meetings and event industry recently being deemed as the second most wasteful sector in the United States by the EPA, we at JW Marriott Austin knew we had to go above and beyond to deliver more efficient meetings and events with the lowest possible carbon footprint. By offering an array of environmentally friendly offerings and programs, the JW Marriott Austin makes it easy for companies and planners to go green for their next meeting or event. The hotel, located in the heart of Texas' vibrant state capital and just steps from city's convention center with 370,000 square feet of meeting and exhibit space, makes the environment a priority at all times. Just by selecting the JW Marriott Austin as the venue for a meeting or event, planners are already making a green choice. It is a built in and effortless choice. With a goal to further reduce energy and water consumption by 20 percent for 2020, the JW Marriott Austin is well on its way to continuing efforts to provide meeting planners and guests the most environmentally friendly venue option for all their needs. Upon its opening in 2015, JW Marriott Austin received a LEED (Leadership in Energy and Environmental Design) Silver certification. LEED is an internationally recognized green building certification system providing third-party verification that a building has been designed and constructed using performance-improving strategies. For example, LEED certified properties focus on resource efficiency by using less water and energy, and reduce greenhouse gas emissions. LEED certification is also the most widely used green building rating system in the world with 1.85 million square feet of construction space certifying every single day. 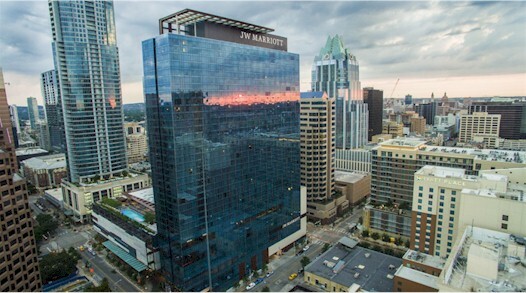 JW Marriott Austin, which features 120,000 square feet of meeting and event space on property, also received a four-star Austin Energy Green Building rating. The City of Austin created the program as the nation's first green building program in 1990, and since then it has grown to be the nation's most successful sustainable building program. Austin Energy Building ratings encourage Central Texans to design and construct more sustainable homes and buildings with the mission to lead the transformation of the building industry to a sustainable future. Certifications like these are essential when it comes to going the extra green mile without leaving a huge footprint. But what exactly do these strategies entail when it comes to JW Marriot Austin? I'm glad you asked. JW Marriott Austin has implemented a variety of strategies to uphold its LEED Silver and Austin Green Energy Building statuses, from everything as simple as updating light fixtures with energy saving light bulbs to utilizing local Texas manufactured building materials, and beyond.